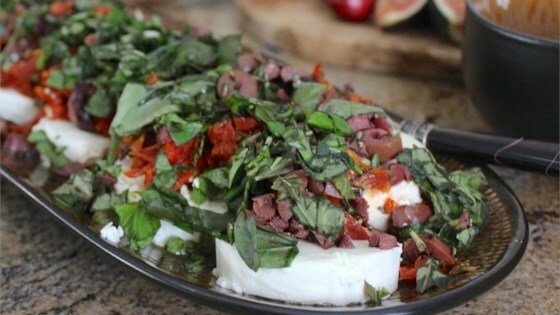 "Marinated goat's cheese with sun-dried tomatoes. Serve with sliced French bread." These marinated rounds of goat cheese are bursting with flavor. I was so excited about serving this at our party, but it was crumbly and hard to eat. Nobody said they liked it or wanted the recipe. :( 3/4 of it was left over. I made this after a co-worker made it. It was wonderful and I did not change a thing! I would highly recommend this recipe!! !